Having worked with so many businesses, helping them to franchise, I know that most of you need a choice in how your consultants are involved. So I have put together a tailor-made-option where you choose which parts of the Franchise Success Path you have our expert team involved with. For a start, you get everything from my foundation Franchise Success Path with its manuals, templates and supporting material, Weekend Franchise Training Workshop and time with me. And then you can choose where you get the additional help from my team. This comprehensive module gives you an in-depth understanding of franchising principles. We go through the Franchise Business Health Check. This is your chance to see if your business is suited to the franchise model. You work with us on your business to look at every aspect. After working through this first component of the Do-It-Yourself-Program, you will know exactly what needs to be done, by when and by whom and you will have taken your huge first step with us on this exciting journey into franchising. Here we establish the best structure for your business and begin to develop plans for marketing the business and attracting the most appropriate profit-generating franchisees. If you wish, you get access to our Kick-start Coaching Program. During four tailor-made sessions, you’ll work one-on-one with one of our accredited business coaches to bring the nuts and bolts of your business together with real project plans and time frames to work to. This is the ‘money module’, the time when we work out where your cash is being generated and where it will flow to. Here we’ll work with you planning your budgets and working out potential franchise fees. We’ll also develop the support and communication systems you need to make sure your franchisees are happy and profitable so they can keep delivering income to you. So you receive a one-on-one meeting with our franchise specialist corporate accountant who will give you their recommendations in which you discover the secrets to crossing the minefield of company structures and tax strategies in the franchise sector. They can also go through your budgets and cash-flows to ensure you are on track financially and have your head around the money-making opportunities that are hidden in your franchise model. We’ll give you access to our franchise territory specialist. You’ll have an initial strategic session with our territory specialist so you can decide the broad direction your territory planning should take. Clear, relevant and comprehensive documentation keeps a franchised business performing and on track. To give you input into how you prepare the rest of your documents – marketing plans, operations and procedures manuals, and business plans for both the franchisor and franchisee side of your new franchised business. You establish a Pilot Franchisee Business which works separately from your main organization. This may be run by your first franchisee. Your pilot checks all your systems and showcases the success of your new franchised business model. You also develop your Franchisor Business so you are ready to deal with all your new franchisees when they come on board. With the core components of your franchise business now in place, this module begins the process of bringing your franchisees on board. And then we will be there with you as you carry out the induction of your first franchisee. …A wealth of tried and tested time-saving support material and document templates … Two free tickets to a Franchise Training Workshop of your choice… Videos of my previous workshops… 25 and growing exclusive podcast interviews with franchise and corporate experts you’d never have access to…Access to regular ‘members only’ forums where I ‘talk franchise’ with other experts in the sector … Admittance to a password-protected Members’ Only website where you’ll find the latest in franchise thinking, additional resources, ideas and tips – and much more. Time and time again, over the last 30 years, I’ve proven that franchising is one of the best business models around. I know that the tried and tested systems used in my Done-For-You Program will enable you to discover that too. 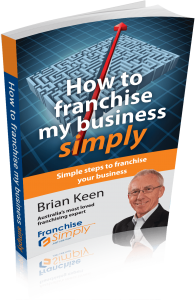 If developing a highly successful franchise operation as quickly as possible sounds like an exciting prospect, why not call me on 1300 960 136, or email brian@howtofranchisesimply.com.au and find out more?